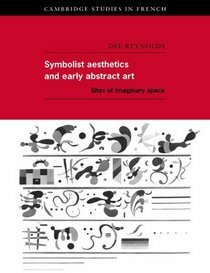 This book presents an innovative analysis of the role of imagination as a central concept in both literary and art criticism. Dee Reynolds brings this approach to bear on works by Rimbaud, Mallarme, Kandinsky, and Mondrian. It allows her to redefine the relationship between Symbolism and abstract art, and to contribute new methodological perspectives to comparative studies of poetry and painting. The late nineteenth and early twentieth century was a crucial period in the emergence of new modes of representation, and is currently at the forefront of critical enquiry. This is the first book to examine Symbolism and abstraction in this way, and the first to treat these poets and painters together. It is an original contribution to interdisciplinary scholarship in art history, literary history, and comparative aesthetics.